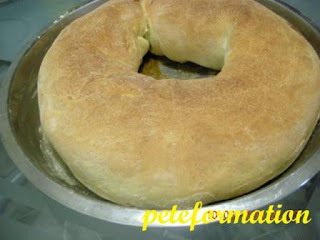 Bread roll with chicken and sausage filling......................a cut with sauce! 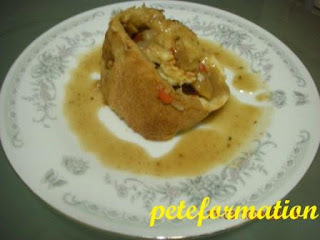 This is how it looked like inside............................................The bread roll sauce. My daughter would bug me to cook supper for her whenever she stays up late to study or do her homework. I learned this recipe from Jamie Oliver, The Naked Chef on Astro Asian Food Channel. Jamie’s recipe and cooking method is simple and easy. This is one my favorite show in AFC channel. I have modified the recipe a little bit to suit our local palate. I did not write down the actual recipe, just put in whatever I can remember. I not sure what Jamie Oliver call this dish but I have named it Bread Roll with Chicken Meat & Sausage Filling. The portion for this bread was so big that my supposedly supper meal turned out to be for breakfast as well for the following next morning! Bread 3 cups of Flour 1 teaspoon of dry yeast mix in water, a tablespoon of sugar, ½ teaspoon of salt and a little flour, to wake them up! Slowly pour the premix liquid ingredients on the flour to make dry dough. Knead the bread dough until it is well mix. Cover the dough with a towel and let the yeast do their job, making bubbles! Filling Chicken meat, 400 gms Onions, 2 pcs, chopped finely Green peas, ½ cup Oregano, 1 teaspoon Thyme, 1 teaspoon Tomato, 2, cut into cubes Worcestershire Sauce, 1 teaspoon Salt to taste Sautéed onions in vegetable oil and butter combination until fragrant. Add in chicken meat and fry until chicken is slightly brown. Add in the rest of the ingredients and stir fry for a short while. Sauce Onions, 1 pcs, chopped finely Worcestershire Sauce, 1 teaspoon Oregano, 1 teaspoon Dark soya sauce, ¼ teaspoon Pepper, a dash or more (to taste) Corn Flour, 2 teaspoon, add with a little water Salt to taste Sautéed onion in butter until it turns soft. Add in some water and bring to a boil. Add in the rest of the ingredients. 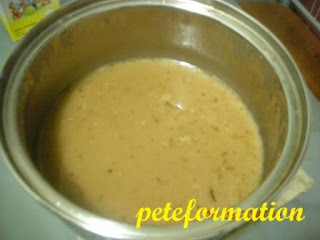 Use corn flour to make the sauce thick. Use a rolling pin to make the dough into a long oval shape. Put in the sausage and fillings. 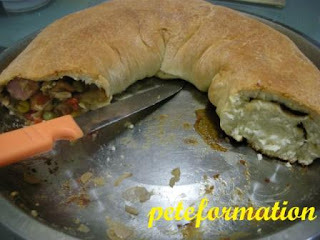 Wrap the fillings in the dough and join both ends. Rub some vegetable oil on top of the dough. Bake in preheated oven at 180deg C for 25 minutes. Cut the bread diagonally and serve with sauce. Misty : Must have a packet of instant noodle or some snacks before you click my link, ha ha ha! LOL! wana try making after my finals! this is really funky! its like jumbo mambo donut with chicken! 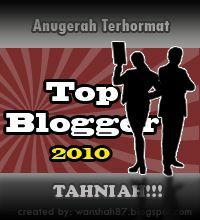 =.= i must do a lot of good deeds in this life so that in next life, i can get a father who cooks! LMAO! Sharon : The bread a bit tough but crispy because I did not leave it overnight for it to expand further. But it soften when eat with the gravy. Overall, taste is nice. LZ : You can add rosemary for stronger flavour! Josephine : My daughter 'terkejut' when she saw her supper meal. Levian : Smells good when hot from the oven......mmmm, yummy....heh heh heh. Misti : Poor Misty, next time I cook for you. Foongpc : One nice recipe from Jamie Oliver! Calvin : Maybe Oily man lorr....ha ha ha! *green with envy I don't make bread! As a matter of fact, I don;t bake! Cakes and cookies - my missus' territory! LOL!!! Mommy : When I saw this in Jamie Oliver show, I gotta try this recipe. Very unique lorr! Sometime, my wife gets very worried when I try new recipe....too adventurous at times....ha ha ha! yoo... so nice!! you are a good cook!! but can you bake as well? Yum, thanks for sharing the recipe.. It's like enfanada.. HELLOO!! I think if I run out of idea what to cook that day, I can just come to your site and follow what you have done!! Must be nice ah! kenwooi : Heh heh,can hear your stomach rumbling leh! chubskulit : Enfanada...interesting name, will check it out! Eunice : Nice to eat, especially hot from the oven! Chris : This is XXXXXL donut, ha ha ha! Mmmmm - can't resist bread stuffed with savory meat and sausage! I wish we could get AFC here in the US - it had a lot of different cooking shows that we don't see on Food Network.